Atlanta, Georgia is a tennis city that is slowly warming up to pickleball. 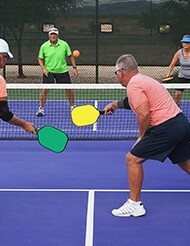 Most folks who play pickleball in Georgia can be found in the Atlanta suburbs. You pickleball fans, you know how to win over your tennis friends, right? The Village at Towne Lake, Woodstock, Georgia is the home to the very first community pickleball court in the area. The court is named after Dr. Thomas Earley, who is well known among the Georgia Pickleballmania crowd. The USAPA.org website lists all registered tournaments in the U. S. The North GA Pickleball Club Annual Fall Classic is one of the local tournaments that offer an opportunity for rated competition. Where is there a pickle ball game in conyers or Covington GA.
Any courts near Brookhaven ? ?